Since 2001, we have been working in close collaboration with the ViệtyÐạo Center in Saigon, the Dien Chan clinic of Professor Bùi Quốc Châu. 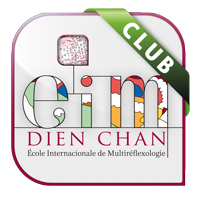 In this time, we have set up the International School of Multi-reflexology - Dien Chan (EiMDC) and created the training programmes for each level, adapting all of Professor Châu’s notes to a Western teaching system. In addition to publishing the complete book of Dien Chan in English, Spanish, French and Italian, with the help of this new 21st-century support, we now offer the definitive multi-reflexology application. Since it was created, the technique has continued to evolve, and we want to share these advances with our students and followers. For the occasion, we have redrawn all the Dien Chan projection diagrams according to the historic tradition of the technique and accumulated experience. Organized into a group of accredited trainers, we propose certified courses in Multireflexology - Dien Chan in various countries in Europe, Latin America, the Caribbean, Polynesia and Africa. All our students receive the same full programme, with no simplification of its fundaments or the original multireflexology method. Our integrated courses are also hosted by leading international institutions and schools in the field of natural therapies. From level 1 of a Dien Chan course, students are members of the EiMDC club, created to support and accompany them as they learn. The club offers a private online space with teaching materials and guidance to complement your professional treatments (+info on the EiMDC website: www.multireflexology.com). Using this interactive application, with the FACEASiT’pro version you can study the different Dien Chan projection diagrams as well as all the set points on Professor Châu’s map. You can also learn to use the multi-reflexology tools, thanks to comprehensive texts describing how to use and apply them. You’ll find all the details on the Studying Dien Chan page on this website. FACEASiT’pro designs all necessary treatments by combining reflex areas or composing formulas of points. The FACEASiT’clinic version also allows you to store treatments and modify the list of suggested points to adapt the treatment to the particularities of the consultant. To find out more, get the complete book of Dien Chan to familiarize yourself with the theories and other essential principles. Our publications, notebooks and posters are available at www.dienshop.com. Where can I study Dien Chan? If you are interested in finding out more about studying and practising Dien Chan, we recommend you sign up for a course. Obviously, we cannot teach at a distance or just by using documents; it is vitally important to learn the movements used in stimulation. Many other subtleties of the technique can only be acquired in person with the guidance of an experienced teacher. During the course and with the assistance of practice with the help of guest “patients”, students can apply and consolidate the theory as they work their way through the course. Consult our agenda of courses to find the city and dates that best suit you at www.multireflexology.com. The International School of Multireflexology - Dien Chan guarantees full official certification. Since 2002, our students have been following structured programmes adapted to the pace of teaching for adults. Each level prepares you to practice and use the technique without limitations. For more information about the School and certification, consult the official Dien Chan website at www.multireflexology.com. The certificate awarded by the International School of Multireflexology - Dien Chan (EiMDC) accredits students and enables them to go on to more advanced courses. The training programmes are gradual, and students must have successfully completed level 1 of Dien Chan before taking specializations such as Chan’beauté. The certificate allows students to continue at the International School of Multireflexology - Dien Chan, at different venues and with different trainers. Our trainers all have a broad base of knowledge of both Dien Chan and other therapeutic techniques. Most have been trained by the inventor of the method, Professor Bùi Quốc Châu, and are active practitioners and researchers. All members of our teaching staff follow the same course programmes, each bringing their individual experience and pedagogical talent. We work with the same enthusiasm and commitment to sharing our knowledge with students. Not only do we concentrate on the theoretical bases of the method, we also consider practice essential to assimilate the technique’s multireflexology approach. 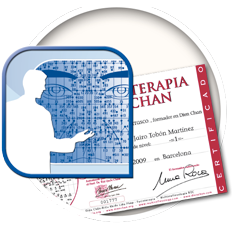 You can consult the résumés of our teaching staff on the official website: www.dienchan.org. Patryck Aguilar Cassarà met Professor Bùi Quôc Châu in 2001 in Barcelona. He immediately developed a passionate interest in the Professor’s research and assisted him in popularizing Dien Chan in Europe. 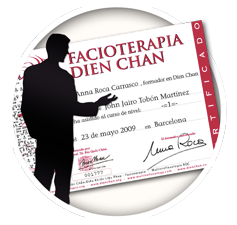 He undertook the important task of structuring the teaching material, the first major step being the publication of the Dien Chan manual, and organized the first course given by Professor Châu in Barcelona. Every year, he invites Professor Châu and one of his children (therapists at the Vietydao Center) to continue disseminating the technique. He runs CLUBQC, bringing together Professor Châu’s former students around the world, and set up the first team of European trainers.